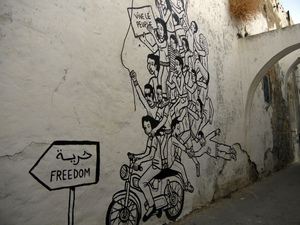 In the past week, dueling demonstrations have occupied public spaces in Tunisia's capital, with media reports estimating turnout in the tens of thousands, making them some of the largest street protests since the Arab Spring uprising that brought down dictator Zine el-Abidine Ben Ali in January 2011. Opposition groups and the ruling Ennahda party called their respective supporters into the streets in an effort to buttress their claims to popular legitimacy. The North African country has been rocked in recent weeks by the second political assassination of an opposition politician this year, as well as clashes between Tunisian soldiers and Qaeda-linked militants near the border with Algeria. What happens in the next few months may determine whether Tunisia becomes a functioning constitutional democracy or finds itself embroiled in escalating political confrontations driven by appeals to the street rather than the ballot box. The current political crisis is rooted in growing public frustration with the work of the National Constituent Assembly (NCA), whose primary responsibility is drafting the country's new constitution. When the NCA was elected in October 2011, leading parties promised the Tunisian people a constitution and fresh elections within a year. Today, nearly two years later, the draft constitution is finally nearing completion. The overambitious constitutional timeframe and political leaders' failure to manage popular expectations after the revolution, particularly regarding the bleak state of the Tunisian economy, have led to mounting exasperation with both the assembly and the government. 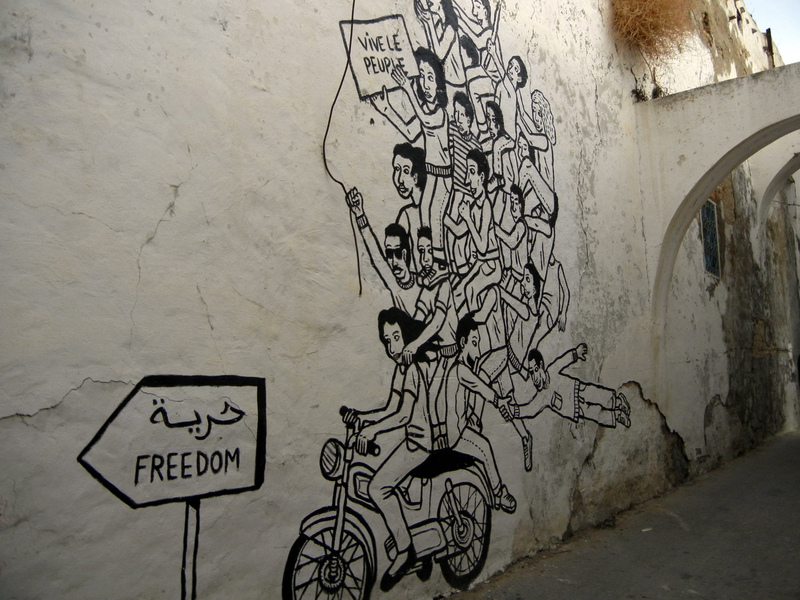 Adding to these tensions, a fierce debate has been raging over the role of religion in Tunisian politics and society. Since the departure of Ben Ali, who enforced a political and legal code based on staunch secularism, the voices of the religious have been able to reassert themselves in the public square. While this has been a major step forward for freedom of expression in the country, it also opened the door to hard-line actors who have at times resorted to violence in opposing what they view as immoral or blasphemous behavior. Meanwhile, secular-minded Tunisians, particularly in the more cosmopolitan coastal cities, have expressed concerns about issues like the growing number of women wearing the hijab (which was actively suppressed under Ben Ali) and questioned the true motives of the moderate Islamist Ennahda party. While Ennahda, which won a majority of seats in the NCA elections, chose to form a coalition cabinet with two secular parties to ensure greater legitimacy for its government, its credibility has waned among opposition groups that suspect it of sympathies with radical Salafists. The widespread perception that the government has chosen not to vigorously pursue or prosecute Salafists for acts of violence and intimidation at a time when criminal charges of blasphemy are growing have only added credence to the concerns of secular Tunisians. The assassination of opposition politician Chokri Belaid in February 2013, in a country where political assassinations were previously unheard of, was a staggering blow. But opposition anger has since flared over the failure of the Tunisian security forces to capture the individuals responsible for the murder, particularly after a second opposition politician, NCA member Mohamed Brahmi, was murdered late last month--allegedly by the same assassin. The most vocal opposition groups and protesters outside the NCA building have made three firm demands: replace the government with a technocratic cabinet, dissolve the NCA, and allow a group of experts to complete the draft constitution. Ennahda, which notably rejected a proposal to form a broader unity government after Belaid's assassination, has now expressed openness to the idea, but it has ruled out dismissing the NCA. In the days after Brahmi's assassination, Prime Minister Ali Larayedh announced the government's intent to push through the crisis by setting a timetable for completing the constitution and holding elections by the end of the year. However, at this delicate juncture, Ennahda must do more than simply denounce terrorism, call for national unity, and proceed with its political plans. Even a reshuffled unity cabinet that incorporates representatives from parties outside of the ruling troika is a necessary but insufficient step to restore public confidence. The government must also take action to demonstrate that it is committed to protecting the voices--and lives--of all members of Tunisian society. Those who engage in violence must be pursued and brought to justice, regardless of their ideological leanings. At the same time, the opposition's calls to dissolve the NCA are a dangerous overreaction. Dismissing the assembly would seriously disrupt the transition to democracy by removing the Tunisian people's elected representatives and throwing the fate of the nearly completed constitution into question. A constitution drafted by an unelected group of experts would have less legitimacy, be less likely to reflect the values of the entire Tunisian citizenry, and be more likely to lead the country into an even greater crisis in the future. The past year's events in Egypt have illustrated the dire consequences that can result when political polarization and exclusion overwhelm democratic debate and participation. To be clear, Tunisia is not poised on the same precipice as Egypt was on June 30. The ruling Islamist party has not demonstrated increasing authoritarian tendencies or rejected the voices of secular groups, as in Egypt. Yet surmounting the current crisis in Tunisia will require a recommitment to democratic principles and a spirit of compromise on all sides. Absolutist stances at this moment, whether by Ennahda or opposition parties, will only lead to further instability. Amid political chaos in Egypt, rogue militias in Libya, and war in Syria, Tunisia is often characterized as the most successful Arab Spring country. It can maintain that title so long as its political leaders, both inside and outside of government, remember the pluralistic values to which they committed themselves when Ben Ali fell. This post originally appeared on Freedom House's blog, Freedom at Issue. To read the original, click here.